After months of waiting, September saw the release of the Intel Core i3-3220 and other Ivy Bridge based Core i3 and Pentium CPUs. This is significant in the marketplace because Intel sells an absolute ton of these CPUs both in the consumer desktop space, but also with low-end servers. Frankly, these days a Core i3-3220 with its onboard Intel HD Graphics 2500 is plenty fast for the vast majority of users. Let’s see how it performs. Feature wise, the Intel Core i3-3220 is cut down. It is a dual core CPU with Hyper-Threading so 2C/ 4T. Cache is cut to only 3MB. Suffice to say, plenty fast for simple tasks. 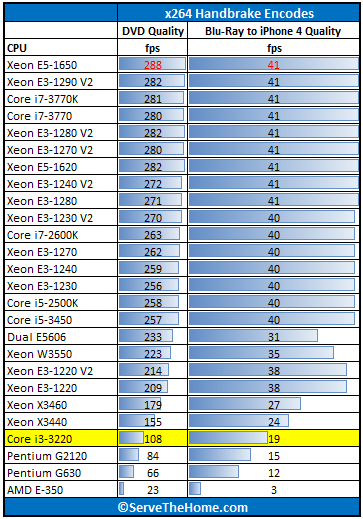 On the other hand, there is a big falloff from quad physical core CPUs. I am going to start off saying that a power user really wants to think Intel Core i5-3450 or better. Here’s why, Turbo Boost which increases clock speed, is not supported, even though it would probably be great on the i3. Intel vPro, TXT, and VT-d, are not supported. AES-NI for encryption acceleration, is not supported. The killer though, no PCIe 3.0 support. Here is my small rant here. Intel has absolutely great technology. Clock speed and cores are great, but at $130 Intel needs to provide more. AMD has CPUs with much better integrated graphics. AMD’s Llano APU lineup costs less and can provide almost as good CPU performance. Sure, those purchasing dual core CPUs may not need PCIe 3.0 HBAs, graphics cards, RAID controllers and etc., but nobody is building a huge server off of the Intel Core i3-3220. There are not enough PCIe lanes and memory expansion capabilities for that type of application. Likewise, it would be unwise to try pairing four big GPUs with a low end CPU in most cases. Still, Intel, why can’t a Core i3 have AES-NI? Intel has the best CPU technology out there at the moment so I wish hardware like the Core i3-3220 standardized on things like using AES encryption. OK I am done with that. 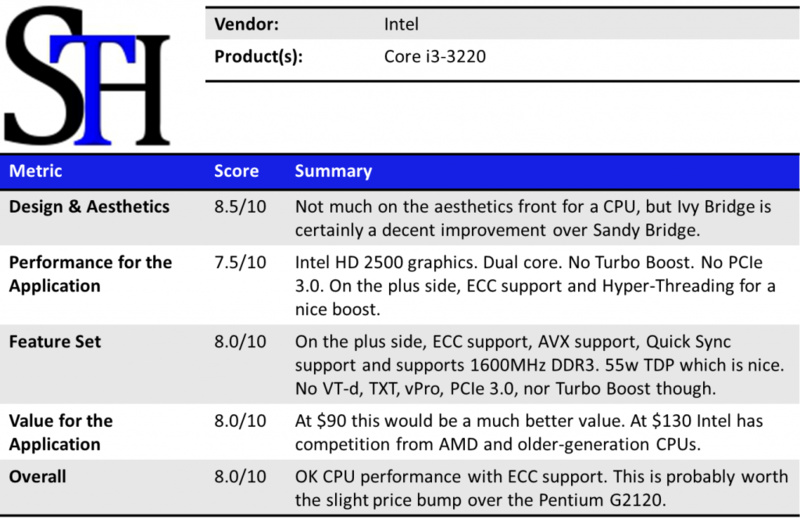 Let’s look at the benchmarks. The trend with Z68 and Z77 chipsets are that the integrated GPUs are more than adequate for basic 2D output. If you are looking for a workstation with a lot of CPU need but where 3D GPU performance was not needed, then Intel’s on-die graphics are going to be “good-enough” for many users one one can use the third-gen PCIe slots for more I/O performance. With that being said, most Z77 buyers will still use discrete GPUs. Power Supply: Corsair AX850 850w 80 Plus Gold + PicoPSU 150XT with 150w power supply. Let’s see what Intel’s new mainstream flagship offers in terms of performance. I decided to use only onboard graphics for this review. Intel added a lot to the GPU, which now takes up about one third of the Ivy Bridge transistor count. I will start off this section by saying that the standard test suite was built to test 1-8 thread single CPU systems. Examples are Sandy Bridge and Ivy Bridge Intel Xeon CPUs. Over time, we have been slowly altering the mix. Clearly, one would expect a different workload between dual Intel Xeon E5-2690 CPUs and something found in a low-end, low-power server like an Intel Pentium G2120. Moving to the 16-64 core realm where the Opterons and Intel Xeon E5 CPUs dominate, it will become ever more important to develop a second test suite. We have been using Cinebench benchmarks for years. Cinebench has been added to the test suite because it does represent a valuable benchmark of multi-threaded performance. We have had quite a few readers contact me about this type of performance for rendering performance. Cinebench R11.5 is something that anyone can run on their Windows machines to get a relative idea of performance. After seeing Cinebench scale from one to 64 cores, it has become a favorite. On one hand, and this is going to be a theme, the performance is much better than the Pentium G2120. On the other hand, even three generation old quad core CPUs are faster than the Core i3-3220. This really shows the slowdown in the CPU race. The Intel Q6600 was surpassed (at stock speeds) by 2C/ 4T CPUs within three generations. That is not happening now that AMD is a weaker competitor. 7-Zip is an immensely popular compression application with an easy to use benchmark. Here is something interesting. In 7-Zip’s compression benchmarks, the Intel Core i3-3220 puts out about half of the speed as the Intel Xeon X3440. There is a nice gain over the G2120 again. Still the native quad core CPUs do well. 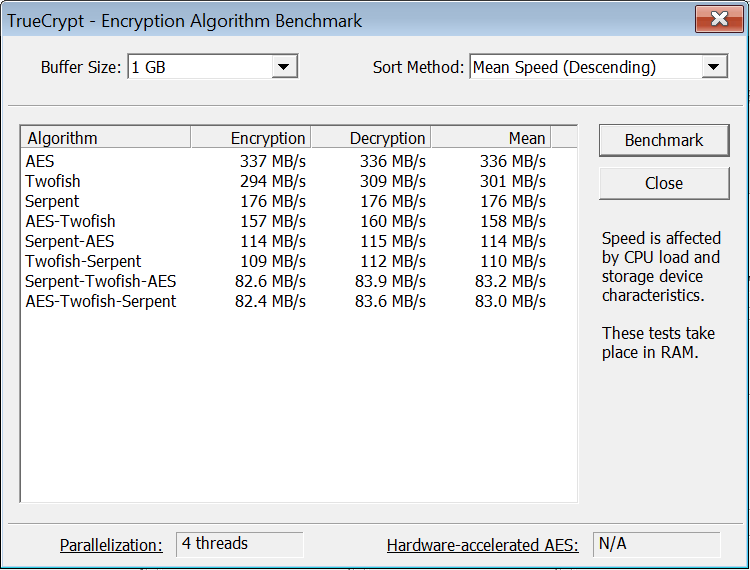 With Intel’s focus on its AES-NI features TrueCrypt can look a bit skewed. Unlike some dubious drivers over the years that were optimized for benchmarks over real world application, Intel’s AES-NI feature does encompass the addition of specialized hardware. This specialized hardware has many practical uses. For example, users of Solaris 11 can utilize the AES-NI features to see much higher throughput on encrypted volumes. AMD has started offering AES acceleration so it is a good test for most CPUs now. As you can see, the Hardware-accelerated AES is listed as N/A for the Intel Core i3-3220. Also, the Intel Core i3-3220 could not muster “real-world” gigabit Ethernet speeds on half of TrueCrypt’s tests. As a result, if you are using advanced encryption with the Intel Core i3-3220, you are going to notice a slowdown at the CPU level. Still much better speeds than the Pentium G2120. We are still using Handbrake v0.9.5. This is just to keep a consistent look at CPUs that have been tested with v0.9.5. We will begin to collect data on v0.9.6 and start using that once we have critical mass. Either way, Handbrake is an extremely popular x264 encoding and transcoding application. It is very common practice these days to encode video for mobile devices. Quick transcoding is an important CPU application. Again, the Intel Core i3-3220 performs well here. It again is faster than some of the lower end options. 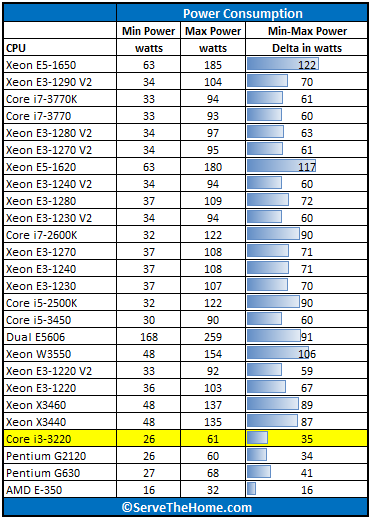 I cannot help but wish the Intel Core i3-3220 ended up faster than the old Intel Xeon X3440. Intel’s move to 22nm is something hearlded as a new era in lower power consumption, especially with tri-gate technology and future process improvements that will increase that number. Using an Extech 380803 True RMS power analyzer which is a really nice unit that even records usage over time. Power consumption stayed low with the Intel Core i3-3220. As a result, it does make a good case in a low power HTPC or server. At the end of the day, the Intel Core i3-3220 is not a blazing fast CPU. Intel cut many features that may be missed by server and workstation users. Things like VT-d for an ESXi server are absent. PCIe 3.0 is absent. Then again, in this segment, many applications will not even use an add-in card so those points are almost moot. I do wish that Intel would not play these feature games. Push computing forward and let the application layer be built around great enabling technology. I did want to point out the bundled Intel retail heatsink is a bit weaker. The Intel Core i3-3220 was able to play Netflix HD streaming acceptably, using a lot of computing capacity. That plus the all aluminum heatsink does mean faster fan spin speeds and more noise using the retail cooler. Overall, a good solution but it is an area where we need AMD to start pushing Intel. The Core i3-3225 has the HD 4000 graphics which is much better. It only costs a bit more. Only wish the 3225 was $100 and the 3220 was $90. Pentium G chips are too expensive this gen.
Test more i3 plz. KK THX. Should not use such a high powered PSU to test an i3. Even though it is 80 Plus Gold, it would be electrically ineffective at low power draw. The PSU issue aside, it would be nice to see how it performs compared with some LGA775 quad core and dual core CPUs. vPro is not true that is not supported. Combine it with a Q77 mobo and you have it.